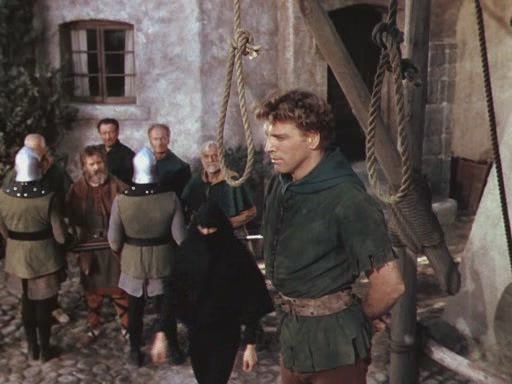 Burt Lancaster was a professional acrobat before he took up acting, so it’s no surprise that he was able to swashbuckle with the best of them in The Flame and the Arrow. Warner Brothers even sent him on a publicity tour during which he perched on poles and re-created his feats from the film. The Oscar-winner displayed his athletic prowess in later films as well, like Trapeze and The Train. 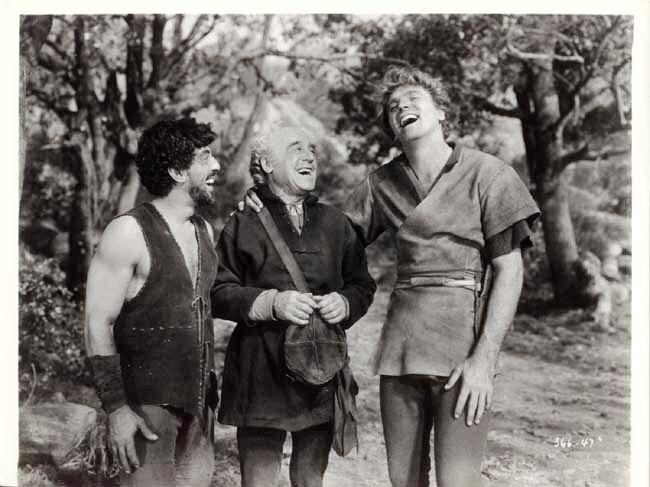 Nick Cravat, who plays Piccolo, was an acrobat who was teamed with Burt Lancaster in the circus (performing as “Lang & Cravat”) before Lancaster became a star. He appears in many of Lancaster’s movies. In this one, and in The Crimson Pirate, he plays a mute. The reason was that his thick Brooklyn accent, which he could not lose, would have been wildly out of place in such period pieces. 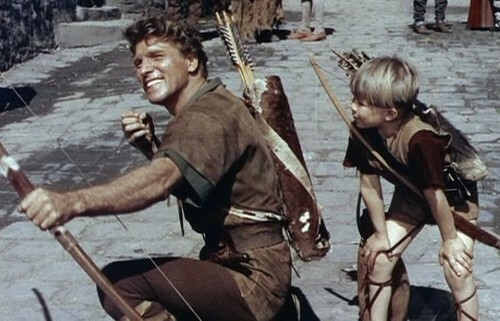 Burt Lancaster was a tough street kid who took an early interest in gymnastics. He joined the circus as an acrobat and worked there until he was injured. It was in the Army during WW II that he was introduced to the USO and acting. After he started acting, one of his demands to the studios was that he have a high bar set up on sets and locations so he could perform acrobatics and stay in shape. Until undergoing emergency quadruple heart bypass surgery in 1983, he maintained the fantastic physical health he attained as an acrobat in his youth. He impressed many who knew him with his apparently enormous strength. Interesting to note, on set, Burt was known as a grump, he would have been the perfect Grumpy Old Man. He admitted that an odd thing always happened to him on a movie set. He would complain about everything, sometimes very loudly. By the end of the shoot however, the crews loved him and hated to see him go, despite his complaints. He never understood why that happened. His son Bill Lancaster’s screenplay for The Bad News Bears (1976) was based on his experience being coached by his father. Bill had been disabled by polio as a child, and according to friend Joel Douglas – the son of Kirk Douglas – the Tatum O’Neal character in the film, the odd kid out, was Bill. The coach played by Walter Matthau was based on Burt, who was known for his grumpiness. 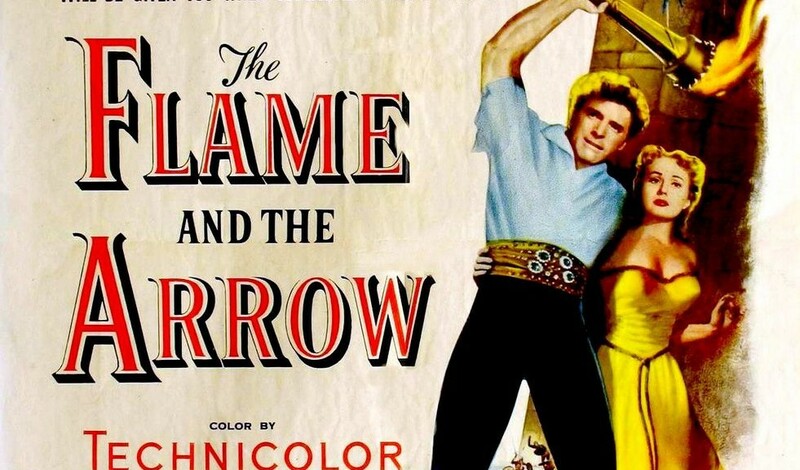 The Flame and the Arrow was directed by Jacques Tourneur for Warner Bros.
Glossary of stunt terms as defined by the Wikipedia – Acrobatics is the performance of extraordinary feats of balance, agility, and motor coordination. It can be found in many of the performing arts as well as in many sports. Acrobatics is most often associated with activities that make extensive use of gymnastic elements, such as acro dance, circus, and gymnastics, but many other athletic activities — such as ballet and diving — may also employ acrobatics. Although acrobatics is most commonly associated with human body performance, it may also apply to other types of performance, such as aerobatics.